The carotid arteries (there are two of them) are arteries in the neck that supply blood to the face and neck and to the front section of the brain. Carotid artery disease is very similar to other arterial diseases such as peripheral artery disease and coronary heart disease, in that it is caused by the build up of plaque inside the artery which narrows the artery and can block it. This process is referred to as 'atherosclerosis'. Carotid artery disease may be present without you knowing about it, although suffering either a stroke or a 'transient ischaemic attack' (or 'TIA') is a possible symptom. In this procedure, the affected section of the lining of the artery is removed and is left with as smooth an internal surface as possible. During the procedure, the arteries are clamped and a small tube called a shunt may be inserted to reroute the blood to the brain around the section being worked on. The artery is then closed, sometimes with a graft called a 'patch'. The procedure is normally carried out under a general anaesthetic and involves making a ~5cm incision on the side of the neck between the ear and the collarbone. It takes around 2 hours, and patients are routinely admitted to the Intensive Care Unit (ICU) overnight for monitoring with a short hospital stay afterwards. 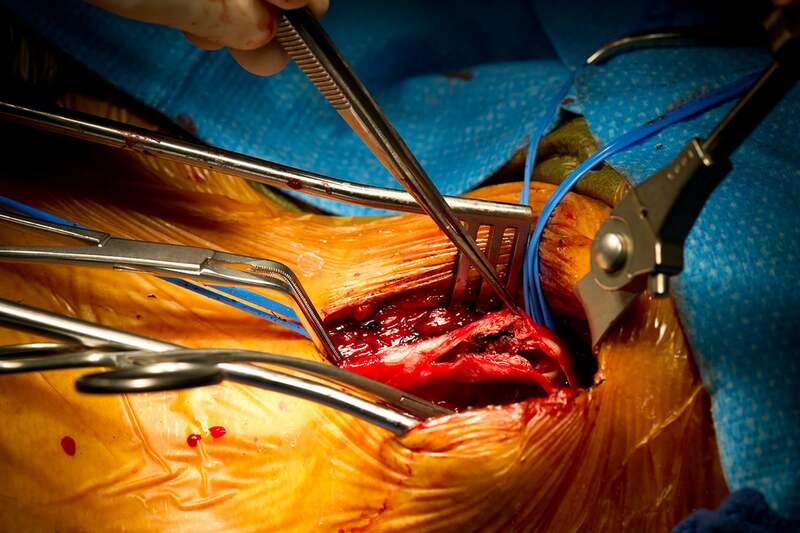 This photo is mid-way through a carotid endarterectomy and shows the plaque about to be removed from the artery. In this procedure, sometimes also referred to as 'carotid angioplasty' or 'carotid artery stenting' ('CAS'), a stent is inserted into the affected section of carotid artery, with the stent left in place to hold the narrowed section open. A balloon is used to open the section of artery before the stent is located in place. 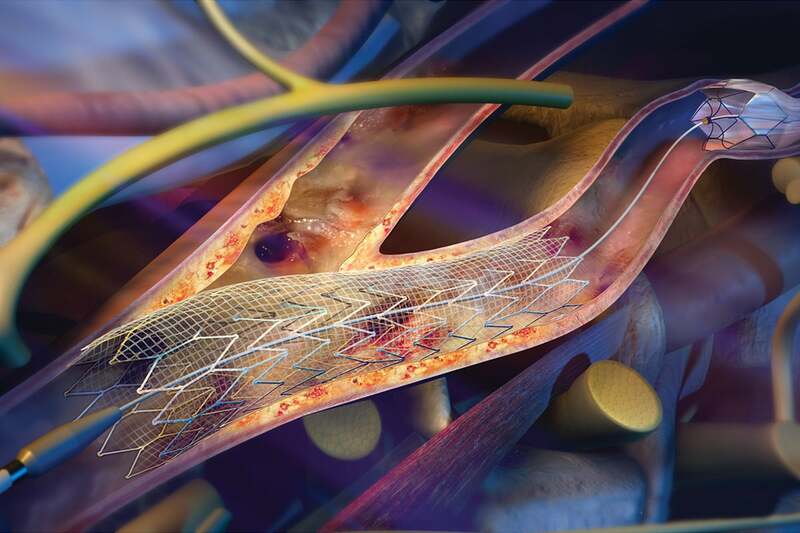 A ‘filter’ is temporarily placed distally in the artery to catch any possible debris. This is a ‘keyhole’ or 'percutaneous' procedure, that is the balloon and stent are moved up into the carotid artery using a catheter which is normally inserted into the body via an artery in the groin. The procedure can be carried out under general or local anaesthetic and generally takes between one and two hours, with a hospital stay of 1-2 days after the procedure. Image depicts a carotid artery stent in place, with a distal filter. © 2017 W.L. Gore & Associates. used with permission. With both procedures, it is recommended not to be involved in any strenuous activity for 2-3 weeks afterwards. Which procedure is most suitable?